Global debt has now reached over 327% of global GDP, $237 trillion. Prior to the financial crisis it was less that $150 trillion. The amount by which it has surged in just one year is the same amount as the ballooning national debt of the United States. The response of our leaders, central bankers and financial thinkers to this latest data? It was good news as it showed that thanks to global growth the ratio of debt-to-gross domestic product fell for the fifth consecutive quarter. No irony in the fact that the economic growth is entirely funded by debt itself – adding another shaky layer to the house of cards. 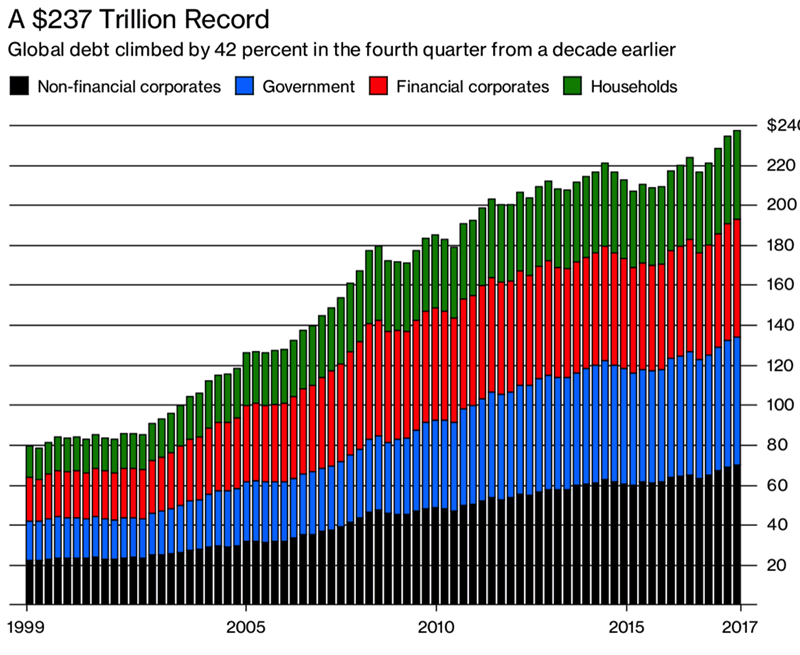 The bottom line is that high debt burdens have left governments, companies, and households more vulnerable to a sudden tightening of financial conditions. This potential shift could prompt market corrections, debt sustainability concerns, and capital flow reversals in emerging markets. A sudden tightening of financial conditions is inevitable. The latest FOMC minutes released yesterday showed that members plan to increase interest rates at a faster rate than previously expected. This was inevitable given the loose monetary policy that central banks have been enjoying for the last decade. In short, the whole world seems to be facing a debt crisis in various forms. Global debt is primarily made up of three groups: non financial corporates, governments and households. Each as indebted as the next, each as addicted as the next with no detox programme on offer. So bad is the debt crisis that five leading economists recently felt compelled to write an op-ed in the Washington Post warning Americans of the impending debt crisis. From this point forward, even if economic growth continues uninterrupted, current tax and spending patterns imply that annual deficits will steadily increase, approaching the $1 trillion mark in two years and steadily rising thereafter as far as the eye can see. This string of perpetually rising trillion-dollar-plus deficits is unprecedented in U.S. history. In recent months, we have seen an inevitable rise in interest rates from their low levels of recent years. Rising interest rates and increasing deficits threaten to build upon each other to send public debt spiraling upward even faster. When treasury debt holders start to doubt our government’s ability to repay, or to attract future lenders, they will demand higher interest rates to compensate for the risk. If current spending and tax policy continue unaltered, higher interest costs will have to be financed by even more debt. More borrowing puts more upward pressure on interest rates, and the spiral continues. Household debt is not just a major problem in the US. In the latest release of figures Belgium, Canada, France, Luxembourg, Norway, Sweden and Switzerland each saw household debt as a percentage of GDP hit all-time highs. Only Italy and Ireland remain as the two mature market countries where household debt as a percentage of GDP is below 50%. Things are even worse in emerging market South Korea where household debt to GDP is approaching parity, currently at 94.6%. Imagine how much worse things will get as interest rates across the board begin to rise. Or, more likely, as central banks change their minds about interest rate rises and allow the period of easy money to carry on. Cue major inflation around the globe and ever-higher levels of debt. The IIF, the group responsible for the data release, point to central banks as the culprits for these devastating figures. This is no surprise as they (as the puppets of governments and bankers) are the reason so many savers, households and investors have had to work hard to protect their assets in the last decade. Such little regard has been shown for the long term health of the economy or value of our hard won savings. 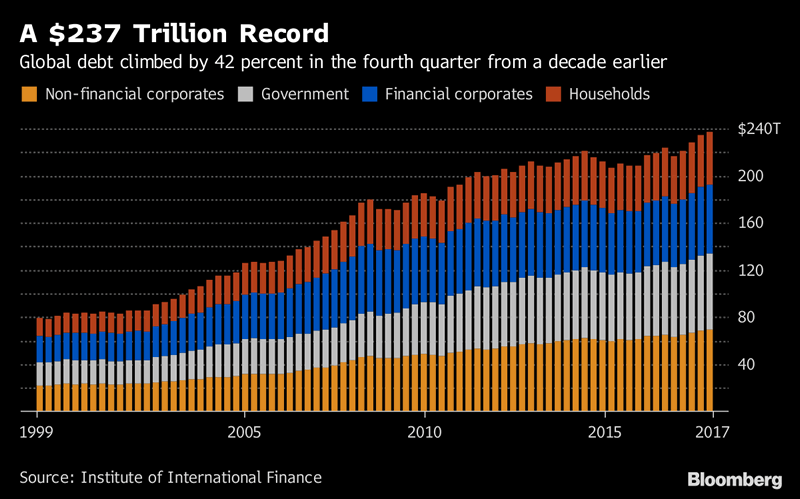 The global debt figures serve once again as a reminder that individuals and businesses must take responsibility for their own wealth and protect it from the ongoing currency debasement and gigantic monetary experiment of central banks. Gold that is held in a segregated, allocated portfolio is a key way to protect your savings from counter-party risk in the financial system. Gold’s performance in 2017 into this year, along with low gold liquidations, increased demand for gold coins and bars and central bank purchases shows the prudent money is again diversifying into gold in anticipation of the next financial crisis.